This AAA Four Diamond resort is nestled in the heart of the Sierra with ski-in ski-out access to Squaw Valley host of the 1960 Winter Olympics. Its 405 resort rooms and suites, complete with residential-style kitchens, fireplaces and LCD flat screen TVs, offer guests a mountain home experience with luxury and full service amenities. 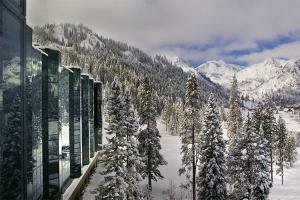 Located at the base of Squaw Valley USA, site of the 1960 winter Olympics and minutes from world renowned Lake Tahoe. At the Resort at Squaw Creek, several enticing restaurants await. Whether you want a romantic dinner for two, an upscale corporate meeting place or a casual family meal, you'll find a multitude of outstanding options to tempt your palate. Sample wines from an award-winning wine list, listen to live piano music, take in the spectacular valley views, catch a ball game, or grab a cup of coffee on the run. It's all just a short walk from your room. Outdoor enthusiasts enjoy endless choices, any time of year. You'll love scenic hikes, fishing excursions and mountain biking in summer, while skiing, sledding and snowmobiling will get your adrenaline flowing in winter. While you're here, make sure you visit the fascinating local attractions. A tour of Thunderbird Lodge or a cable car ride to High Camp at Squaw Valley USA will make your trip even more memorable.